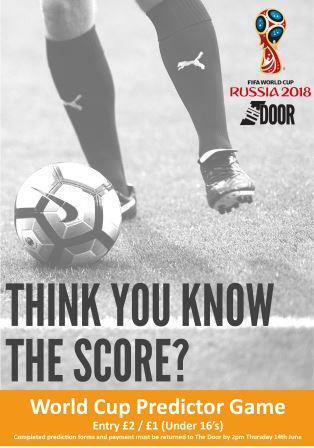 With less than 4 weeks until the start of the FIFA World Cup in Russia, The Door is launching its “World Cup Predictor” game. Do you think you’re a better pundit than Alan Shearer? Can you out-think Gary Neville? Prove your Football Knowledge by predicting game results right up to the final itself in Moscow on 14th July. Or simply have a go, guess and see if you can do better than the “experts” anyway! Entry forms can be obtained from The Door Shop, The Door’s youth centres or downloaded online. Entrance fee is £2 or £1 for under 16s. All proceeds go to support the work of The Door. Prize winners will be announced via The Door’s social media after the final.